A song you'll hear quite a bit this Christmas season is "It's the Most Wonderful Time of the Year." While that's accurate, it's getting close another wonderful time of the year—draft season. For a lot of fan-bases, draft season has been around for some time. The Panthers are still in the playoff hunt, but it’s a longshot, leaving draft season more in sight that most want to admit. Carolina just isn’t a playoff team. So I’ve been looking forward, and I found three players that could help Carolina significantly depending how things shake out. The three selections vary on Carolina’s first round draft status. Depending how the next two weeks go, it's possible that he won't be available. Assuming that the Saints indeed win the division, Carolina will land somewhere in the top fifteen, which may be just enough to get the big hitting safety. He's a great all-around player who has already been compared to some of the greats. The Panthers pride themselves on their young, physical core. Star Lotulelei, Kawann Short, Luke Kuechly and Josh Norman fit that mold, while rookies Benè Benwikere and Tre Boston profile as more speed-driven players. Collins is the perfect fit for that secondary. He's a hard hitter with decent speed and good coverage abilities. Strong safety is an area of concern for the Panthers long term, so he fits the bill of being a perfect mix of a need/value pick. The University of Alabama hasn't been the best at putting out elite NFL safeties, but you evaluate players, not their uniforms. Some will want an offensive tackle here, but that simply doesn't match up in terms of value. The Senior Bowl, Pro Days and the Combine could change that, but I like Collins more than the tackle options in outside the Top 5 overall. If you want a surefire left tackle, the big lineman from LSU isn't your guy. But if you want a potentially great football player, he could be it. He's a hogmollie in the truest form. A run and pass blocker, he doesn't have on glaring weakness. The Panthers love to run so naturally he could slot in. Unfortunately given the position’s current status in Carolina, he may have to play left tackle immediately. If that's the case, there could be a reconnection on the left side of the line with former LSU guard Trai Turner. Dave Gettleman and Ron Rivera noted multiple times during 2014’s draft the similarities between LSU and Carolina’s offensive blocking schemes. There’s plenty of room for Collins on this line, and oh yea Byron Bell stinks. The very off chance that Carolina does good enough to have a pick this late, I’d be jumping for joy on that turn around, and I’d also be happy with another late first round receiver pick. 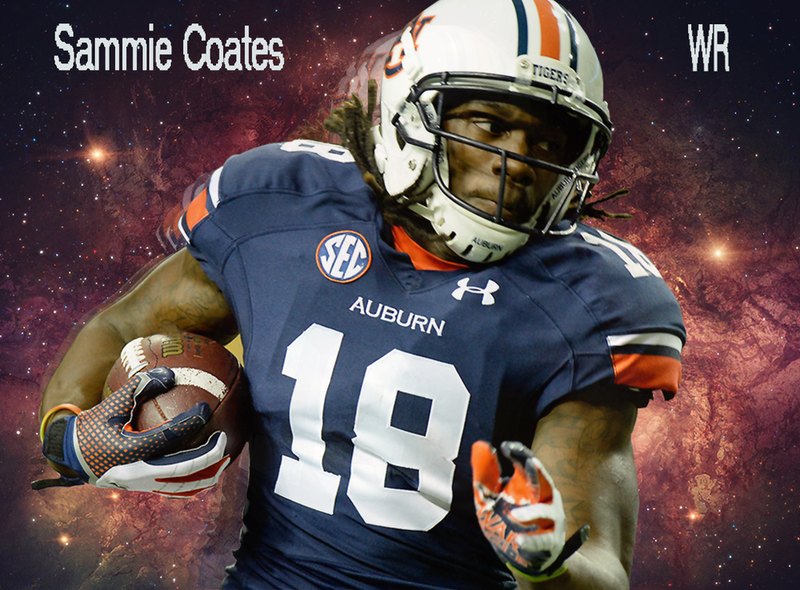 Sammie Coates is that guy. If Carolina decides that they want all the potential in the world, and also create matchup problems, Sammie Coates is the way to go. The Auburn star’s size and speed creates matchup nightmares for defensive coordinators. Put him on the other side of Kelvin Benjamin, and you may just ruin a couple of defensive coordinators’ careers. Coates unfortunately suffers from the same problems that Benjamin does—drops. Ricky Proehl has received high praise for his work with receivers, so I’m guessing he could help Coates maximize his potential, while minimizing the old dropsies. Coates with Benjamin and the emerging Philly Brown would be a potent mix. If La'el Collins is taken, and Carolina finds themselves outside the top fifteen, I could even see Coates sneaking in the top 25. He is the type that will light it up the combine and fly up draft boards. In the end, it doesn't really matter where in the first round Carolina picks. There are tons of needs on this team, and these are all options that would help this football team. As far as who I would prefer, I’d hope for Landon Collins, be excited for Sammie Coates, and understand La’el Collins. Any of these guys would make an impact, even as rookies. They fit the scheme, play a position of need, and profile as long-term investments.